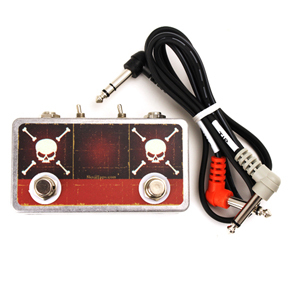 The Double Tap Controller Skull Tap with Polarity switches has two dedicated momentary footswitches and output jacks. With the polarity toggles, you can set either switches to Normal Open or Normal Close. With the Polarity Switches set to Normal Close this would be an ideal controller for Boss RC Loop Stations. Also, you’ll be able to use other tap tempo devices with this switch or in combination with a Loop Station.